Includes IOBA member Charles Seluzicki of Charles Seluzicki Fine & Rare Books. This year marked the 15th Seattle Antiquarian Book Fair (SABF). 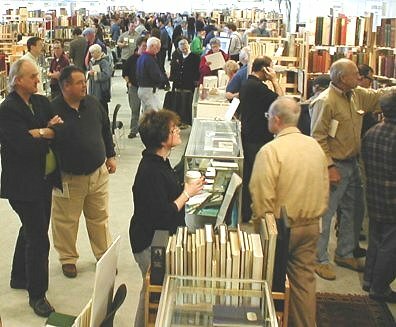 This annual autumnal event is said by many exhibitors to be one of the best book fairs not staged by the Antiquarian Booksellers’ Association of America (ABAA), but this year’s occasion was noteworthy not only for the exhibitors, attendees and millions in collectible material sold, but also as a snapshot of the current used book industry. As Seattle has been enjoying unseasonably dry weather, a picturesque fall weekend was no competition for the attentions of approximately 1800 devout book buyers who visited the fair Saturday, October 12th, and Sunday, October 13th. Attendees viewed and purchased from the stock of 94 dealers representing Canada, Germany, and the United States, from New England to the Eastern seaboard and across the Mid West to the Northwest and down the West Coast. Over two-thirds of the dealers were returning exhibitors. Two book databases also exhibited –MyOwnBookshop.com and BiblioDirect.com. According to fair producer David Gregor, highlights of sales included, in the opening minutes of the fair, a local collector bought a complete run of jacketed Nancy Drews from a Seattle seller. Another Seattle bookseller sold a first U.S. of the Lord of the Rings Trilogy for $17,000. A cookbook collector purchased three boxes of material from the first exhibitor they visited. One Midwest dealer spent over $40,000 on books, while a New York firm added approximately $75,000 worth of new material to their inventory. As the fair was ending, a $50,000 set of illustrated books was awaiting the final collation of the buyer. The vast majority of sellers reported that sales exceeded expectations. And there were an equally large number of dealers whose primary objective was to buy well and they reported that they were pleased with the material available. What this year’s event highlighted is that book fairs still have a vital role to play in professional bookselling. In recent years, book fairs saw a decline in on-site buying as the curse of the internet was at its peak. “Why buy from you at that price if I can go online and get it cheaper?” was the thinking of bargain-hunting customers. The truth is EVERYONE needs to see books and booksellers in person. The average buyer has now gotten stung at least once purchasing sight unseen, with condition not accurately described, and wants to invest money in quality books from a dealer they have met and whose stock has been perused. For dealers, the proliferation of shop closures has made it extremely difficult to scout when visiting an area or even locally. The savvy book fair exhibitor is also keeping an eye out for books that may be requested by a buyer at some later date—knowing “where the bodies are buried” is a value added service. The Seattle event is unique among book fairs. It is produced by two long-time Seattle dealers, Louis Collins of Louis Collins Rare Books and David Gregor of Gregor Books and Book Seminars International. The pair draw on their own experiences of exhibiting at numerous book fairs world wide. They are in the singular position of completely understanding the needs of participants and the current climate of the used book industry. Thus, they strive to present a consistently polished showcase for a wide variety of material from the hyper-modern to the true antiquity, from posters and photographs, to the printed word in all its formats. In recent years, they have adjusted the schedule to allow for a full day of set-up and exhibitor-to-exhibitor sales. Collins and Gregor have also modified the fair’s days and times to best meet the average book lovers’ weekend constraints. And while the producers and 35 of the exhibitors are members of the ABAA, this fair is open to all professional dealers. In fact, 15 of this years’ dealers were first time exhibitors in Seattle. These sellers came seeking exposure for storefronts, cooperative bookstores and full and part-time internet-based operations. Of the six members of the IOBA exhibiting, all have been traveling to Seattle for many years. Additional pictures and a complete listing of exhibitors are available at the Fair’s website: http://www.SeattleBookFair.com. Returning participants are given first right of refusal, with any remaining spaces open to non-returning booksellers in March of 2003. If you would like specific information about exhibiting in 2003—October 11th and 12th—contact Louis Collins at 206.323.3999 or bookfair@SeattleBookFair.com.